Has Canada Turned Back the Clock with Iranian Immigration? 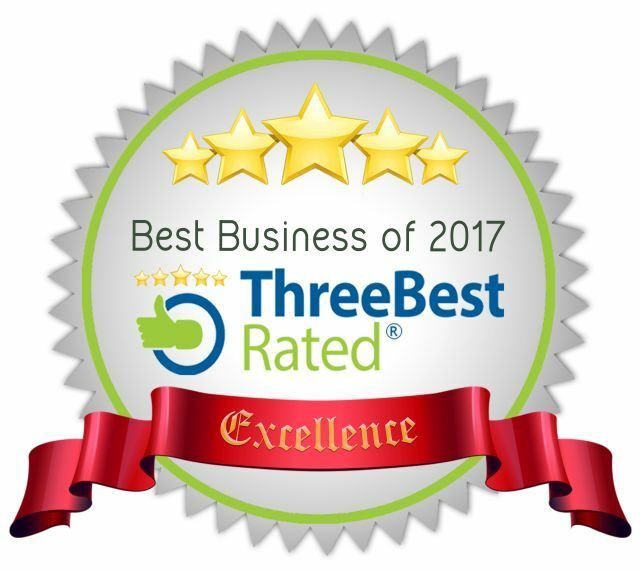 While these categories have been modified and updated several times since – especially under the Harper Administration – they laid the groundwork for what has been called chain migration. Chain migration is a difficult-to-measure concept that involves the amount of migrants that a single migrant from a foreign country is “responsible” for bringing to Canada. That is, when an adult male migrates to Canada to work, for example, within several years his family and in-laws may follow him. While this is hard to pin down numerically, the length of time it currently takes to process the enormous backlog of family sponsorship applications is an indication that chain migration does indeed exist. In the past Canada – worried about chain migration – has tried to control immigration by source country; reflecting prejudice towards certain areas of the world. But with the 1976 Immigration Act the focus began to shift to education and language abilities, as well as work experience increasingly as of late. In today’s world, however, where terrorism and national security are often a top priority, has there been a return to discrimination against immigrants based on their country of origin and/or ethnicity? And how can or should Canadian immigration authorities distinguish between a common citizen and a hostile country? How has Canada’s evolving immigration rules and regulations since 1976 affected Iranian migration? As Iranian politics have undergone dramatic changes in the last 40 years, so has the nature of Iranian migration to Canada. Before the Iranian Revolution in 1978-79, there was barely a trickle of Iranian migration to Canada. Most of it was economic. In the ‘50s there were less than 100 immigrants from Iran to Canada on an annual basis. That grew to several hundred per year in the ‘60s and by the late ‘70s it had grown to around 600 per year, still very low compared to other groups. The Iranian Revolution and the creation of the Islamic Republic – a fundamentalist Islamic revolt against the Shah of Iran – changed the country immediately and led to the fleeing of opponents of the Ayatollah Khomeini and an upsurge of Iranian immigrants to Canada. With the addition of the Iran-Iraq War that lasted from 1980 to 1988, most migrants from Iran during the ‘80s were political refugees rather than those seeking economic opportunity. From 1990 onwards, however, the motivations for migrating became economic as well, as they had been prior to the Iranian Revolution. Relatively wealthy and well-educated Iranian professionals left Iran in the ‘90s to the tune of about 200,000 to countries like Canada, Australia, and the United States. In Canada the numbers increased from hundreds to thousands per year from 1981 onwards. As Canada had changed its immigration policy in 1976 and no longer discriminated based on where an immigrant came from, Iranian migrants were subject to the same point system as everyone else who applied to come to Canada. The flow of Iranian migrants remained steady at several thousand per year. While Canadian governments were concerned about the Iranian regime and their likely support for terrorism, they did not discriminate against Iranian immigrants who wished to move to Canada. This has changed in the last several years as relations between the current government in Ottawa and the regime in Tehran have deteriorated. First, sanctions against Iran were announced in 2010. Then further sanctions followed in 2011 with the downgrading and then the closing of Canada’s embassy in Tehran by 2012. It seems that Iranian immigrants have been caught up in the freeze-over of Canadian-Iranian relations. Investor immigrants and provincial nominee program applicants have seen their applications delayed for years in what seems to be a general reluctance to processes them on the part of Canada’s immigration authorities. In part, the fact that many Iranian businessmen have had links with government-controlled companies that are targets of Canadian sanctions means many do not qualify, as we have pointed out previously at IMMIgroup. As well, as revealed in a 2012 Canadian Border Services Agency (CBSA) report obtained by the media in early 2013, the Canadian government is concerned about the “sinister motives” of some Iranian refugee applicants. Before being expelled from Canada in September of 2012, some Iranian diplomats had apparently been encouraging the Iranian community in Canada to “rebel” against Canadian culture and to try to “occupy high-level positions” in the Canadian government. As the Middle East crisis in Syria and surrounding countries worsens, it seems that Iranian refugees and regular applicants wishing to migrate to Canada have to face a very rigorous screening process that citizens of many other nations do not. How to balance between national security concerns and the rights of immigrants to a fair process is becoming a very difficult act for the current government. If one looks beyond the hostile relations between the Canadian and Iranian governments, Iranian-Canadians themselves are a relatively prosperous and entrepreneurial group, compared to many other immigrants to the country. 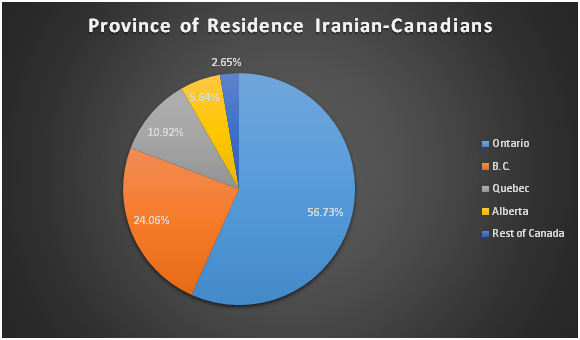 The 2011 Census revealed 163,290 Iranian-Canadians living in Canada. Iranian Canadians also tend to settle in urban areas where there are more economic opportunities for their skill levels which tend to be either professional and/or entrepreneurial. 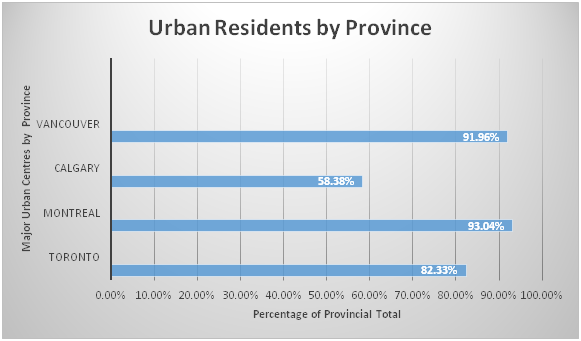 One can see that – with the exception of Alberta – the great majority of Iranian-Canadians live in the major urban centre of each respective province. A slight majority of Iranian-Canadians are between the ages of 25 and 54. 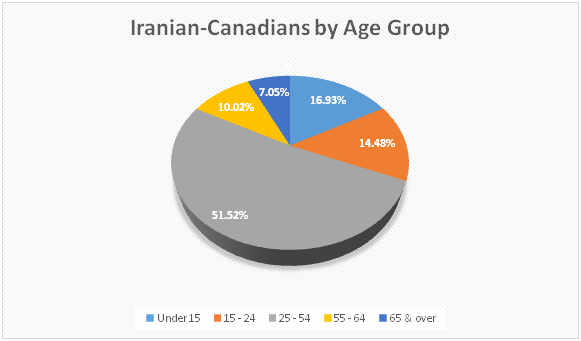 If you include those aged 15 to 24 years, then you account for 66%, or almost two thirds, of Iranian Canadians. Add in those under 15 years old, and you have almost 83%. In other words, the overwhelming majority of Iranian-Canadians are of school age or working age. Hossein Amanat: Architect and Urban Designer. Ghermezian family: Billionaire real estate developers. Karim Hakimi: Founder of Hakim Optical. Ramin Karimloo: West End performer who has appeared in the Phantom of the Opera and Love Never Dies. Hassan Khosrowshahi: Founder of Future Shop. Reza Moridi: Ontario Liberal MPP for Richmond Hill, physicist and engineer. Shahrzad Rafati: Founder of Broadband TV Corp.
Samantha Tajik: Miss Universe Canada 2008. With a list like this, one hopes that CIC and CBSA find a way to ensure national security objectives are achieved without turning away the next founder of a Future Shop or Broadband TV Corp, or a Hakim Optical. Provincial nominee programs, please take note.